The first North British Railway station on the site dated from 1846. 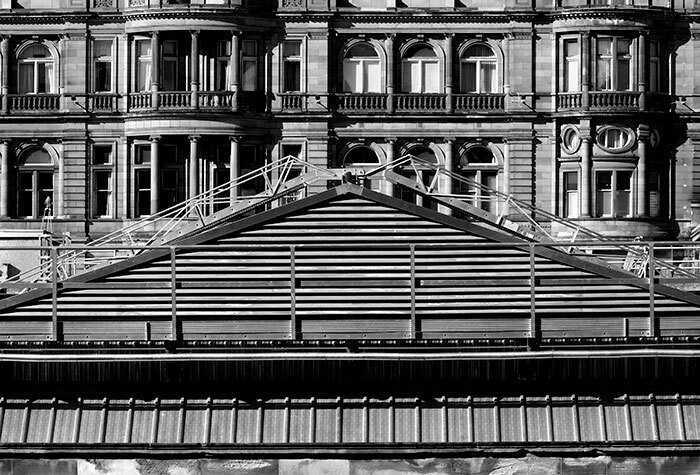 The present Waverley Station was constructed by them in 1868 and extended 1892-1902. A major overhaul of its layout and structure will be completed in 2014. It's set in a deep valley that was once occupied by the Nor Loch between the medieval Old Town and the New Town begun in the eighteenth century to relieve overcrowding. Access from Princes Street is by the Waverley Steps adjacent to the North British Hotel opened by the railway company in 1902. Once in the open air, the steps are now glazed over. The 1868 station also replaced the termini of the adjacent Edinburgh and Glasgow and the Edinburgh, Leith & Newhaven Railways. The lines of the latter were aligned north-south and its trains were cable hauled through the 1,000 yard and inclined Scotland Street Tunnel bored under the New Town and Princes Street to their Canal Street station. Closed to trains in 1868, the tunnel is extant but out of use. 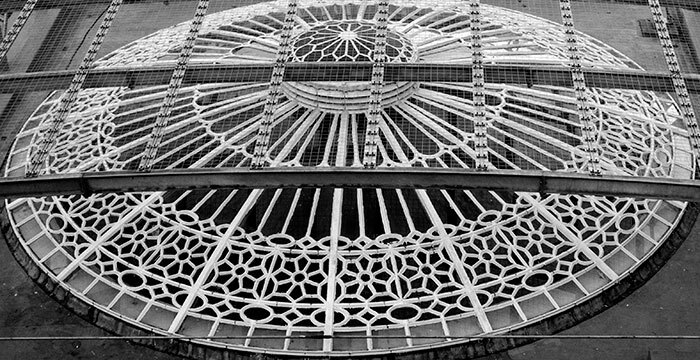 The unusual ‘radial fanlight' masonry of its northern portal is in a public park on the site of Scotland Street Station. 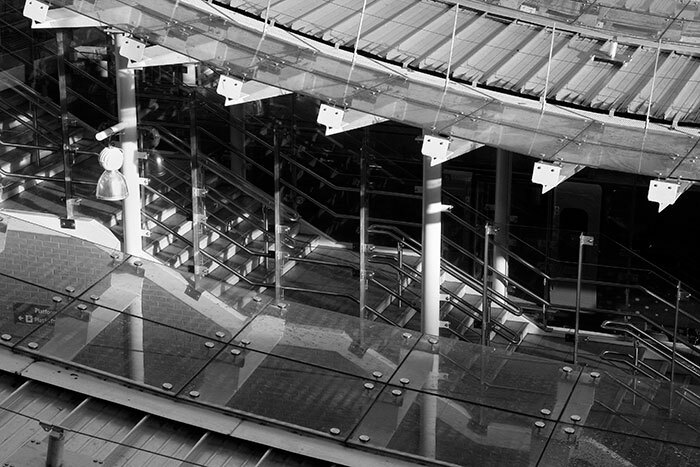 The frameless glass pieces in the canopy are supported by tree form columns descending the centre of the stairs to the station concourse. 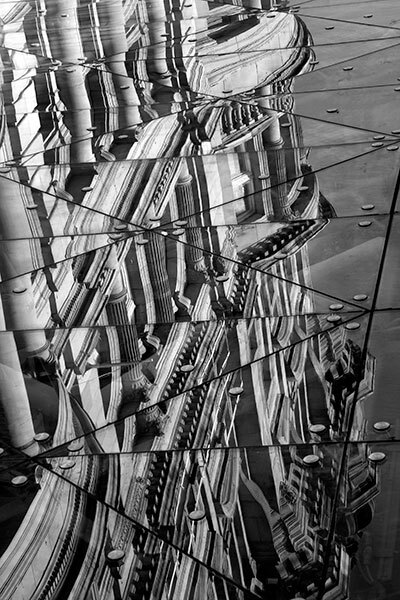 Its outer surface carries reflections of the richly formed and textured stone façade of the North British Hotel recorded in the first image. 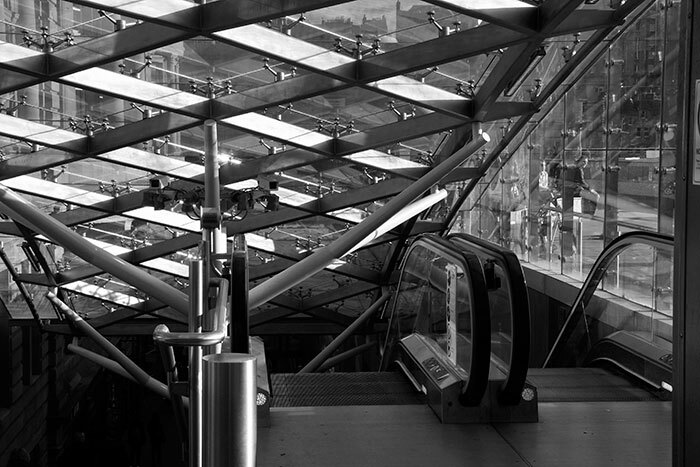 Visually and physically, the new enclosed stairs, escalators and lifts create a much more pleasant transition between street and train. 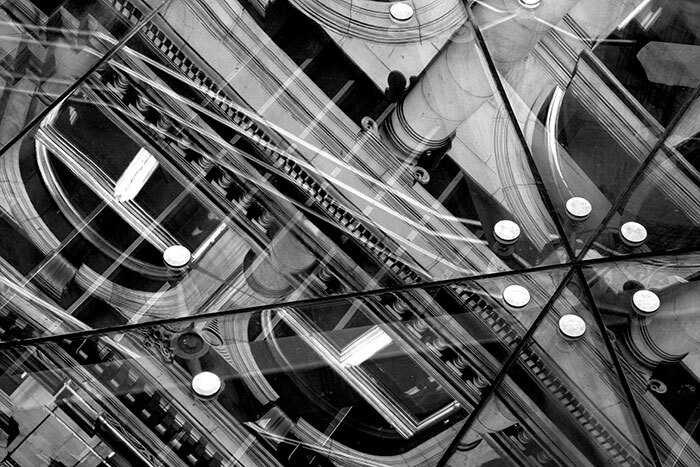 A reflections theme offered many variations and this is another made during the short time I had available that evening. Earlier in the day I had looked at some early twentieth century photographs of Edinburgh, one of which depicted a three-track tram on Princes Street. I remember Edinburgh electric trams but had no idea that they were preceded by cable cars. Built in the same decade as the first of the San Francisco cable lines, the twenty-one mile system operated from 1888 to 1923 when it was expanded and converted to electricity. Had I known more I could have walked a fragment of the rails and slot system left in place at the east end of Princes Street literally yards away as I turned the corner on to North Bridge. I could also have walked to the remains of one of the three cable car depots a quarter of a mile away. The massive North Bridge of 1897(Image 15) crosses the station in three spans. 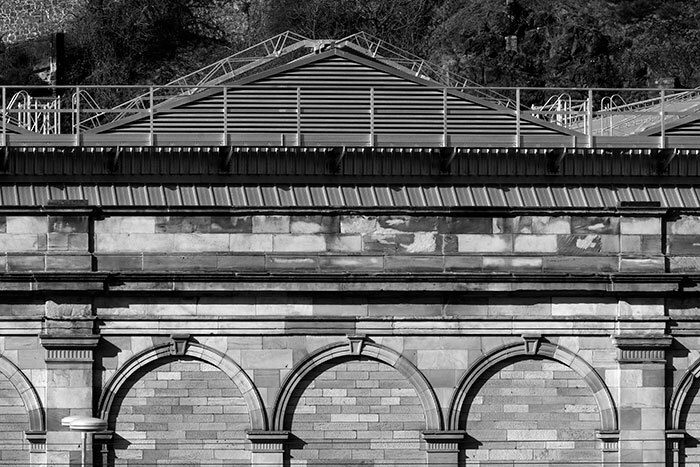 Its six foot cast iron parapet and a stone pier made it difficult to photograph the iron and glass dome covering the centre of the square Victorian booking hall below. The pristinely cleaned and painted Victorian metalwork now supports twenty-first century framing to the some 28,000 panes of new glass on what is effectively a new roof. It's in marked contrast to the structure's begrimed and shabby state before the renovations began: in the steam railway era it was much worse. 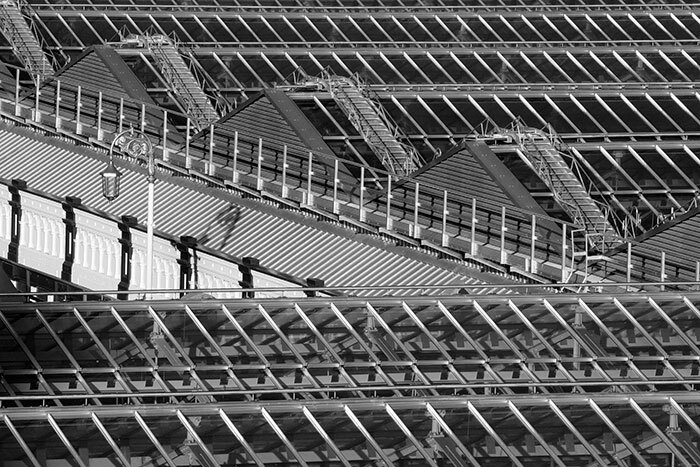 I liked the repetition of the design elements and the glint of light from the new metal and glass on the great roof expanses east and west of the Bridge. 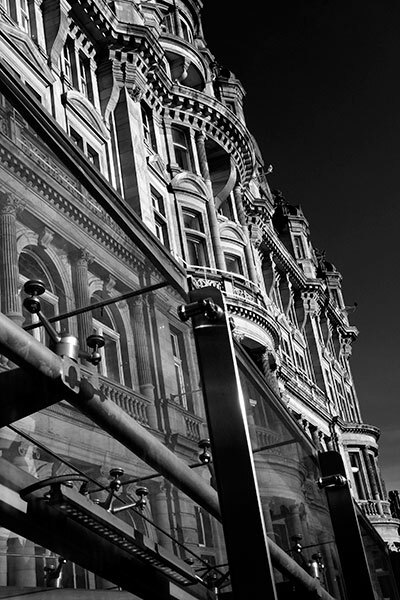 Waverley's deeply set location precludes the grand entrances and facades presented by other major stations such as London's Kings Cross and St. Pancras, both superbly restored and enhanced in recent years. 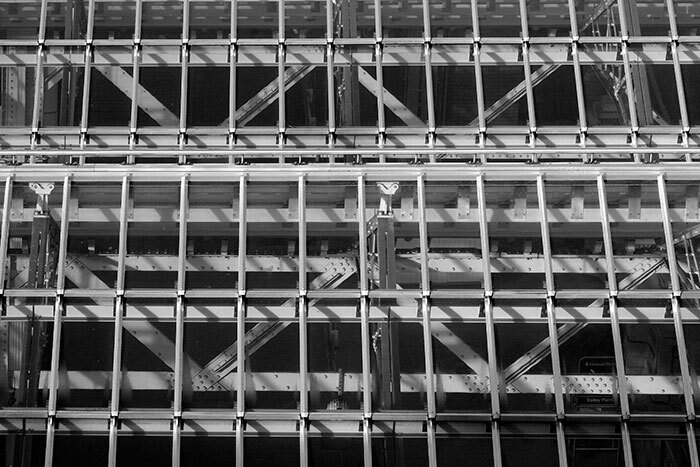 A longer lens concentrates on one of the two access ramps from the Waverley Bridge to the west. The bright metal cladding and glazing rests on painted cast iron walls flanking the roadway. The southern edge of the roof rests on the long sandstone boundary wall of the station. A covered island platform fills the space between it and the Market Street retaining wall. 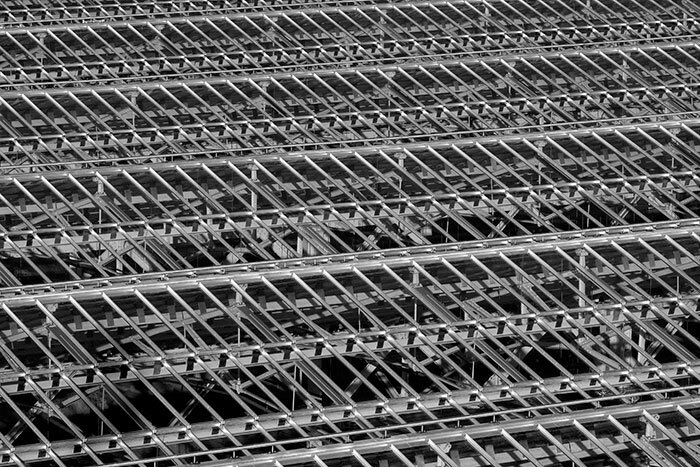 Access gantries running on rails across the ridge and furrow glazing are supplemented by walkways. 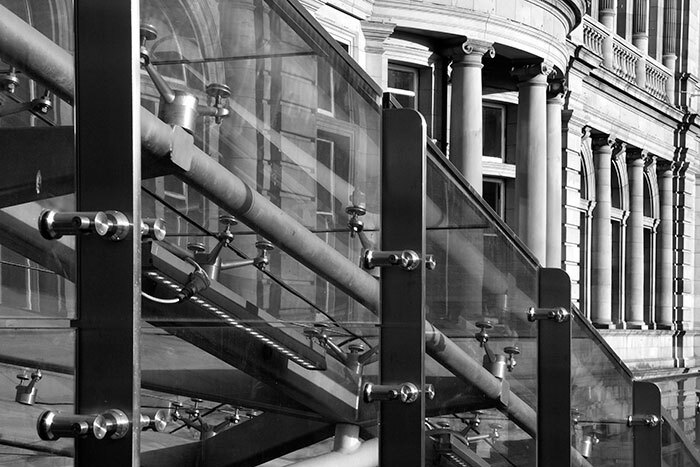 The public staircase of the Scotsman Steps links the North Bridge and Market Street below. Completed in 1899, its 104 steps are contained within a five-storey octagonal tower built into the elaborate façade of the then printing headquarters of The Scotsman newspaper, now elsewhere. 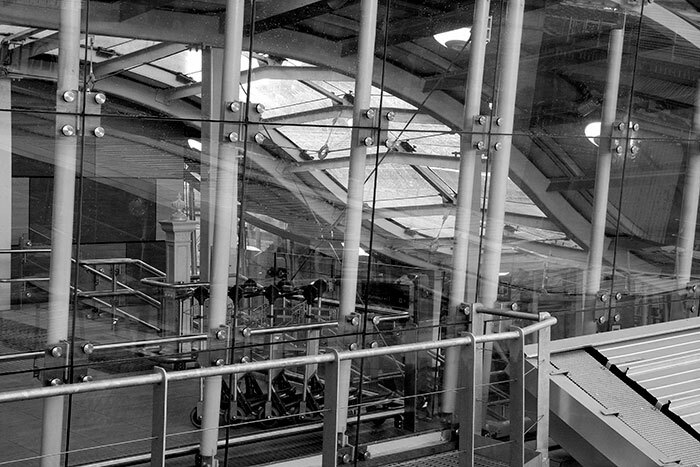 This image from the steps shows part of the new covered steps leading from street level to the passenger platforms below. The Scottish artist Martin Creed is a past winner of the Turner Prize. He was commissioned to create an artwork within the tower and his Work 1059 completed in 2011 was the response. The by then drab and worn original structure was restored and each individual step was clad in variously coloured marble sourced from many countries. 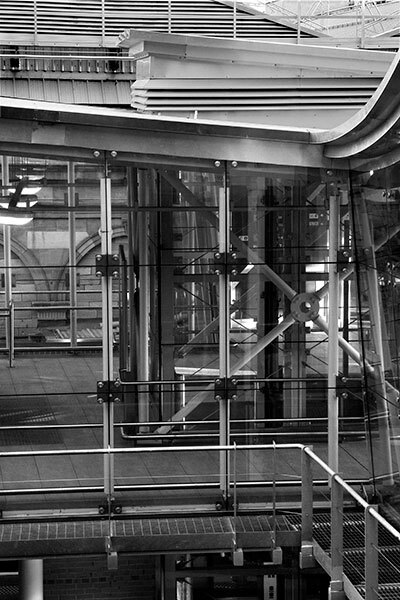 The new station entrance structure leads to the original walkway to Princes Street set closely under the train shed glazing. An earlier cast iron newel post is wrapped within the new stairway balustrading. 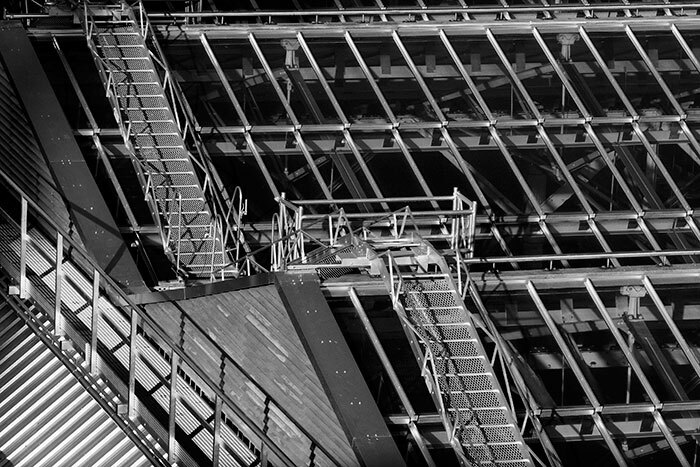 This is a detail from the new entrance and lift tower linking Market Street to the passenger platforms immediately below and the elevated walkway across the station to Princes Street. The contrast in the visual qualities of repetitive shapes in metal roof and stone façade appealed. 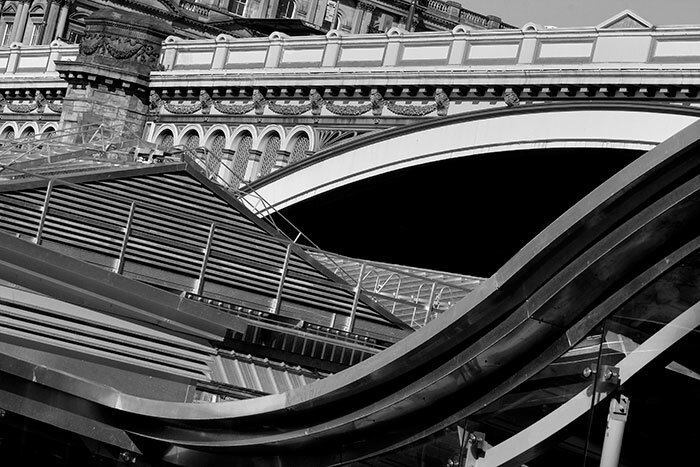 A changed angle of view from the same position brings together the opposed curves of the entrance structure and the massive ironwork of the North Bridge straddling the station. A long and deep block of buildings in a grand classical style faces Waterloo Place to the north of the station. The simpler detailing on its southern façade seems more elegant. 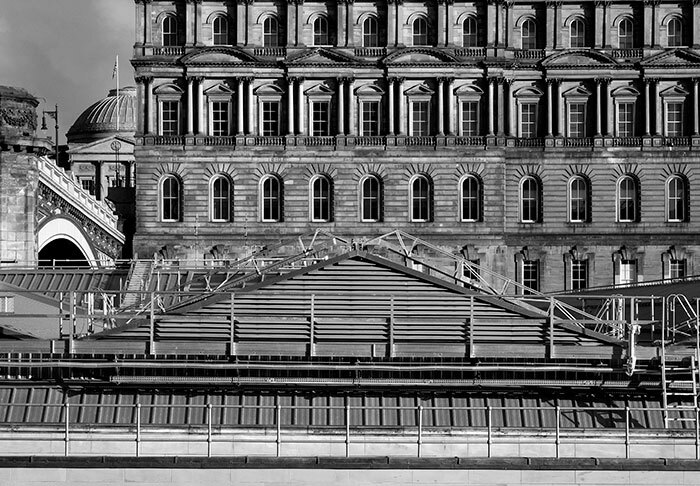 An arch of the North Bridge and the dome of the National Archives of Scotland building are set to the left. I liked the visually contrasting stratum of classical facade, roof structure, parapet, blind arcading and canopy framed within this image. Further east on Market Street the station's architectural backdrop gives way to the rock-face of Calton Hill. 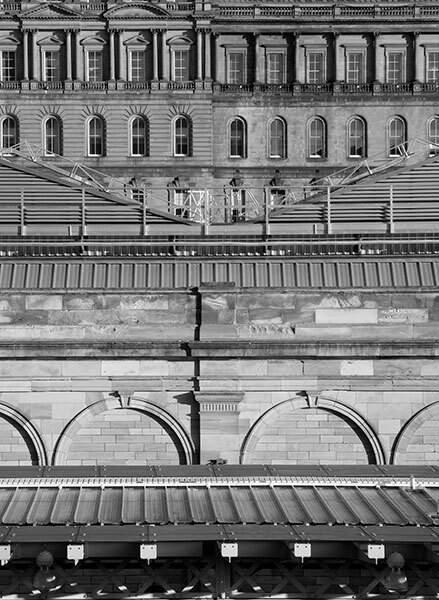 This is the clearest possible view of the sandstone blind arcading forming the southern wall of the main station building.